You’re likely going to get a much more consistent and improved gaming experience if you invest in a good keyboard. Feel, mechanical keyboards just feel better to type and game on, they’re more consistent and give more feedback so you’re sure you’re hitting the right keys. Responsiveness, mechanical keyboards offer switches that produce significantly crisper feedback than a rubber dome keyboard, you’ll know if you actually hit the key you meant to press. Mechanical keyboards also pack in higher polling rates, meaning it’s talking to your PC and sending commands much more frequently than a basic keyboard. Features, gaming mechanical keyboards often come packed with software that allow you to set up macros, RGB and other neat settings. If you have a sequence that you’d like to program, like a DOTA 2 courier sequence, you could potentially map that to a single key to use in a single game. Convinced? Here’s everything you should consider when buying a keyboard. The first thing you should figure out is what size keyboard best suits your needs. The limiting factor being the size of your desk, there’s no point in getting a giant honking keyboard if there’s no room left for your mouse to move around. For gaming we’d recommend the smallest you can get away with, bringing your hands closer together is better for your ergonomically and gives your mouse hand more room to move at lower DPI and sensitivities. The 60% keyboard accommodates the smallest desk surfaces and does away with all the F keys, arrows keys, the insert cluster and numpad. I personally use a 60% setup and would highly recommend anyone who doesn’t need a numpad for number crunching to consider one, 60% keyboards usually have macro layers to access the insert cluster, arrow keys and F keys. For a pure FPS player, I think this is a size you should look at, considering most FPS games don’t require a huge number of keyboard combinations to play. The 60% is my personal size of choice, I find I can play Overwatch, Starcraft 2 and DOTA2 all just fine on a small keyboard, though for DOTA2 I had to re-learn some f-key shortcuts. Tenkeyless keyboards removes the numpad section of the keyboard saving roughly 3 to 4 inches off the end of the keyboard. This size allows you to keep arrow keys, insert cluster and F keys. This is probably the size that I would recommend to everyone as a default not knowing what games they play. As long as you’re not using the numpad for gaming function (you weirdo) then there’s no retraining on this one, but you get more space to do those nasty flick headshots. Full size keyboards are the keyboards you know and love, full size keyboards are great if you play games with a keybinds like MMOs or flight-sims. Otherwise, the numpad will not be missed unless you’re an accountant by day or do a ton of number work. This is the reason why they’re called mechanical keyboards, under each keycap is a mechanical switch that is responsible for registering your keystrokes, these mechanisms are built in a variety of ways to give a variety of typing and more importantly, gaming experiences. Spring: Switches are responsible for the force required to press down on the switch to actuate, it’s also responsible for resetting the switch to neutral position. Each switch type falls into 3 major categories, each has its distinct features and they’re not inherently better than the other, it’s personal preference which switch type you like. Clicky switches make an audible clicky noise when pressed, accompanying that is usually a very distinct bump that gives you physical feedback that the key has been pressed. Clicky switches make a lot of noise, so if you game at night or you just don’t want to annoy anyone with your AD or APM spamming then you might want to skip clicky switches. Tactile switches are like clicky switches, they have a physical bump in the middle of the keypress travel but they don’t make a distinct click noise when pressed. Linear switches don’t provide and audible click or bump near the actuation point. You bottom out a key when you press hard enough that you fully press down the switch, this is also measured in force, a higher bottom out weight means that it’ll be much harder for you to press all the way down on each individual key. A heaver key switch allows for heavier fingered gamers and typists to have a more tactile experience, while also removing chances of accidental key presses. Key travel, how far the switch goes from fully depressed to bottoming out. You’ll likely be experienced with lower travel keyboards in laptops like the new Macbook (yuck). The standard travel distance is 4 mm but there have been a few low travel mechanical switches released in the past few years. Unless you know you prefer a shallow travel, I’d stick with a standard travel key switch. 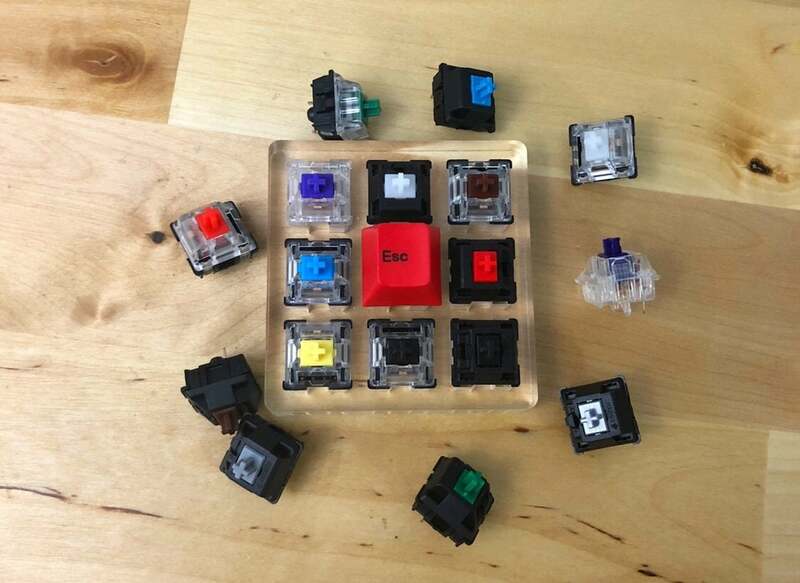 There are several large manufacturers of switches including some major brand proprietary switches on this list, I want to point to some of the bigger switch brands, for a full comprehensive list of what’s out there, check out our big list of keyboard switches post. Romer-G, Logitech’s keyboard switch produced by mouse switch manufacturer Omron, they emphasize on pure gaming switches with great LED stems, these stems however are not compatible with aftermarket keycaps. This is just a quick rundown of the switches that major brands might use, there’s a huge universe of more niche switches out there. We’re not covering other major switches like Topre, ALPS/Matias or buckling spring since they’re not really suited for gaming given how heavy and niche they are. I’d recommend getting a keycap tester to figure out which keycaps you personally prefer. 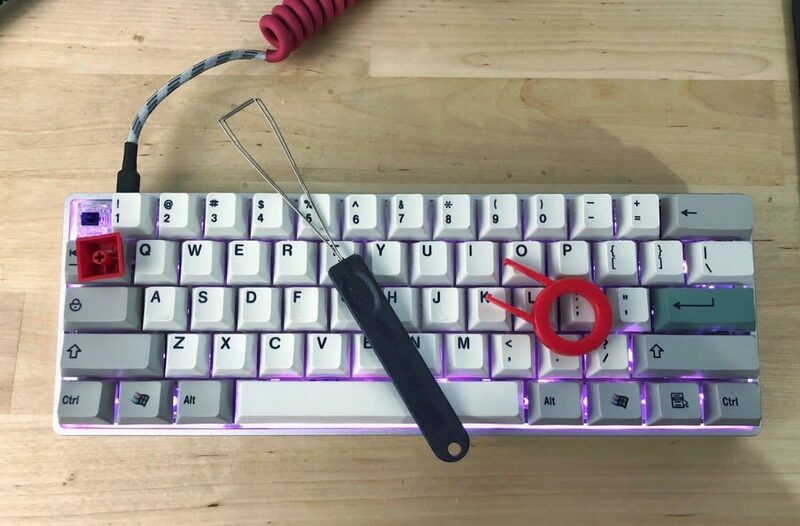 This WASD Cherry MX Switch Tester is a good place to start. O-rings are little rubber circles that can be installed on the keycap to reduce the clickety clackity noise of mechanical keyboards when you bottom out on the key, most brands don’t include these, but if you’re in an environment where people are sleeping or just annoyed at the noise O-rings can be acquired cheaply on Amazon and are very easy to install, these ThreeBulls ones do the trick. The case houses your keyboard’s PCB, keys and back plate, it’s important that the case of your keyboard is made with a good strong material, either a thick high quality plastic or metal. Make sure you look for keyboards that don’t easily creak or flex. The material will also affect how the key press feels when your keycap hits the case, so make sure you go and test a few boards to find ones that you like. Cases can also be high profile or low profile, it’s an aesthetic preference, though low profile cases allow for easier dusting and cleaning. The clear winner of these types is metal, you want a steel or aluminum back plate in your keyboard so when you’re hammering on keys there’s no flex or give to your keyboard. The longer keys on your keyboard like the spacebar and shift keys need a stabilizer because the switch itself isn’t wide enough to hold up the keycap. Costar stabilizers feature a wire insert that is hooked underneath the long keycap to stabilize the key. Costars have a much better feel than Cherry stabilizers but they’re much harder to work with when swapping keycaps and they can be a little rattly noise wise. There are a lot of factors that greatly effect how your keyboard feels, but it’s less important than the other factors above because you can replace the keycaps after the fact with different ones, as long as you buy a keyboard that has standard keycap sizes. You can get replacement keycap sets at several online stores, I like KBDfans, Massdrop and Geekhack for group buys. 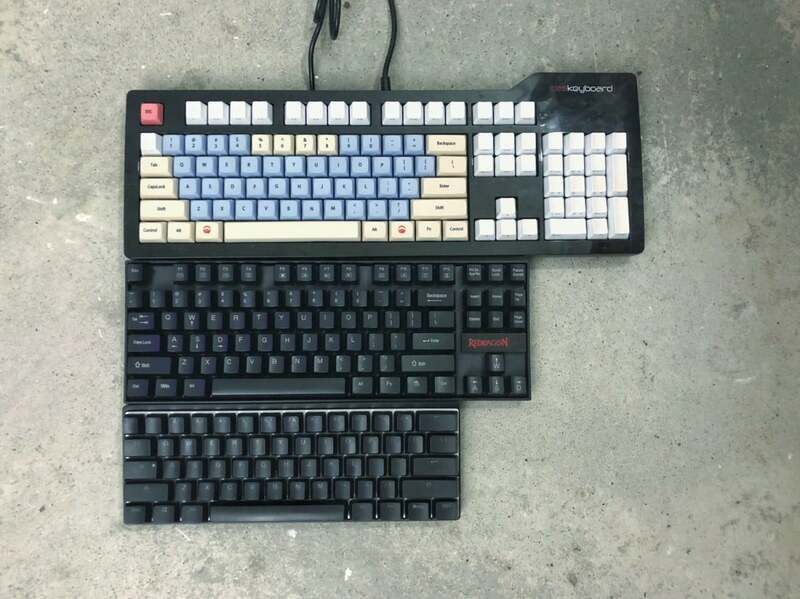 Keycaps are made out of two main types of plastics; Acrylonitrile butadiene styrene (ABS) and Polybutylene terephthalate (PBT). 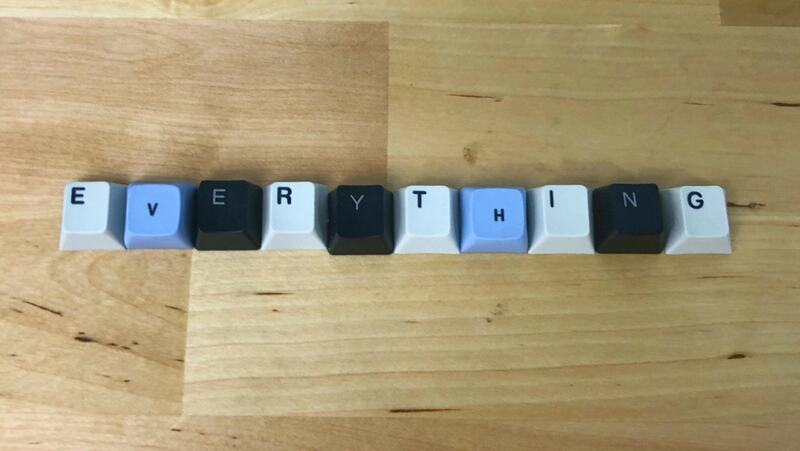 ABS keycaps are more common, they’re found on a large majority of mainstream keyboards, and as a baseline material they get the job done. There’s a clear winner though, you want keycaps to be made of PBT. PBT keycaps are thicker, more dense and more durable. They have a more satisfying sound when typing and they don’t develop that shiny plastic feeling when used over long periods of time. If you can find a keyboard you like that uses PBT keycaps, I’d pick that 100% of the time over an ABS keyboard. The cheapest way, it’s as it sounds, legends are printed onto surface of the keycap, the legends will rub off eventually with this method. Dye sublimated keycaps have ink essentially injected into the plastic through a heat treatment process. These legends will be much more durable in comparison to pad printed legends, you’ll usually find this type of legend with lighter keys and dark legends. Doubleshot keycap involve fusing two separate molds of plastic to form a single keycap, this method produces a crisp, durable keycap. This type of keycap most commonly comes in ABS plastic, but I’ve seen more PBT doubleshot keycaps are hitting the market in 2018. To get the most out of your dollar, you’ll want any process other than pad printed, with double shot being the most impressive on a keycap in terms of crispness. Also take into account font, there are some really ugly legends out there. The tops of keycaps can also vary in shape and angle, these shape variations can be subtle to extreme, you can only know which keycap profile you prefer by trying them out, if you don’t have the desire to try out a bunch of profiles then I would recommend you go with the default OEM profile. Flat and sculptured keycap can also have a spherical shape or cylindrical to the tops of their keycaps, what’s better is completely up to preference. Some mechanical keyboards pack in nice to have features that aren’t essential to your gaming experience, but might tip you to picking that board over others. Some keyboards come with individually lit RGB key switches, some come with underglow, some have only one light as a backlight and some keyboards don’t come with any backlighting at all. There can be a wide range of quality in RGB, you want to look for keyboards that have lots of modes and customizable options as well as keycaps that shine through with light cleanly. Brands like Logitech and Steelseries have invested a lot in making their RGB top-notch. Most major software brands of keyboards come with software that all do an admirable job of programming macros, RGB lighting and saving configuration setups. I don’t think any of the major brands have software that put it ahead or behind each other. There are keyboards that don’t have any software and rely on onboard memory to keep certain configurations and some keyboards with no configuration at all, which isn’t a downside, but it depends if you have any specific keyboard shortcuts/settings you like to use all the time, even then you can achieve the same thing with keymapping software. If you need or want extra keys for streaming shortcuts, controlling or you’re a healer in an MMO then you might want to look at keyboards with purpose built keys for programming. The new standard for keyboards should be a removable USB cable, preferably a USB type-C over the awful mini USB. I would recommend choosing a keyboard with a removable cable over a one that cannot be removed. Some keyboards also include USB pass through for your mice or headsets if that’s something you’d like. Most keyboards come packed with adjustable feet so you can set your keyboard angle preference, though most sources say that it’s more ergonomic to have your keyboard lay flat. Nearly all keyboards are polling at 1000 hz and poll fast enough to register key presses in time, this isn’t like a mouse where it has to constantly report movement data. You can safely ignore this spec or marketing material. Gold plating is a non-factor in performance, it doesn’t improve conductivity on switches or anything and is only present in keyboards to allude a premium perception (and the ability to charge you more for it). Ghosting is a non-issue in most keyboards, for some reason a lot of brands explain ghosting as the same as n-key rollover, where if you press too many buttons at once some of the buttons won’t register, but most gaming keyboards will have n-key rollover and eliminate thie issue. It’s good practice to use a key cap puller and take off all your keycaps for a thorough deep clean once in a while.